You will Watch One Piece Episode 468 English Dubbed online for free episodes with HQ / high quality. Stream anime One Piece Season 14 Episode 10 Hard Battles, One After Another! Devil Fruit Users vs. Devil Fruit Users! Ace is still upset that the Whitebeard Pirates and Luffy are still trying to save him, but decides to accept whether he lives or dies. Whitebeard tricks Buggy into helping him, noting that despite being weak, he has powerful followers who could pose a threat. 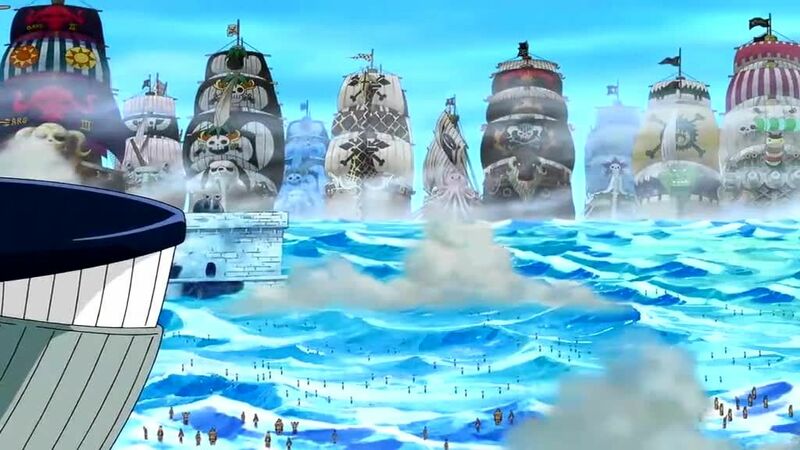 Whitebeard, sensing that the Marines have a plan when the forces in front of them fall back, orders the ships under his command to attack the Marine ships flanking him. Jimbei fights with Moria and defeats him even when he steals several shadows to increase his power. Smoker attacks Luffy and manages to pin him down, but Hancock, angered by him attacking Luffy, attacks him and manages to kick him despite his Logia powers with her Haki. Ivankov encounters Kuma, saying they knew each other. However, Doflamingo reveals to Ivankov that the Kuma he knew is dead.